Back on earth, things were cool. But not that cool. 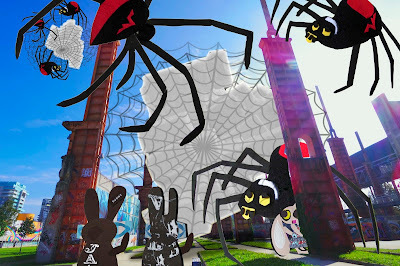 Marshall Duetta's spiders brought as many as the ice floes they could capture and the Wabbit felt he should supervise. "Front legs down a bit, back legs up a bit." Marshall Duetta rattled all her legs. "Leave the capturing to us." The Wabbit shrugged. "What do you think, Wabsworth? Should we break the ice?" Wabsworth was the Wabbit's android double but was his own android nonetheless. "It won't break. It's not our kind of ice." The day blistered in the sun and the Wabbit felt hot and bothered. The floes promised refreshing coolness but steadfastly refused to melt. "Take them to the North Pole," suggested Wabsworth; "It could use some more." Lapinette thought that was a good idea. She leaned from a metal tower. "Global warming won't melt these in a million years." Wabsworth smiled and activated his sensors to make a brief analysis. "High pressure. Variable density. The molecular structure is a cube lattice weave. And there's something else I can't determine." A floe crashed to the ground but hardly made a sound. Then another. A wall of unyielding ice grew long and high. The Wabbit hissed. "The Ice Mice know about the something else. They usually do." "Then they'll be here soon," said Duetta. The Wabbit flashed all of his 28 teeth. "Post sentries," he muttered; "Everyone else take five for cold drinks."